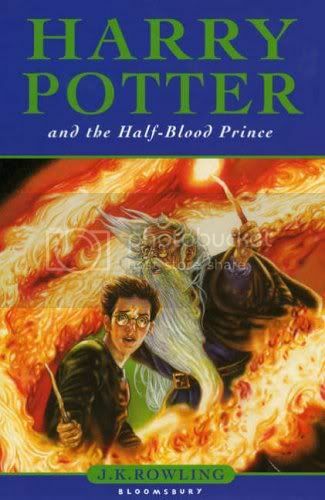 Harry Potter and the Half-Blood Prince by J.K. Rowling - WARNING! I am reviewing the Harry Potter ooks with the idea that those who read my reviews have read the books. There will be spoilers. If you haven't read Half-Blood Prince, read no further. The excitement of the previous books continues in Half-Blood Prince. Not only does the wizarding community now know for definate that Lord Voldemort is back, but us readers know thisis the sixth book, that there is one book left, and after finding out at the end of the last book about the prophecy, the steaks are higher. I absolutely loved getting to look at all the memories that show Voldemort's history in Harry's lessons with Dumbledore. It makes Voldemort seem more human, which makes it even more disturbing that he became what he did. I can't help but feel slightly sorry for him because of the events that led up to is birth and left him parentless, but god, he was vile! The whole idea of Voldemort's horcruxes is just genius, because it's so complicated and you realise just how hard it will be to defeat him, and he great mission that it will be to find and destroy them all. It just goes to show, despite the fact that he is completely beyond evil, Voldemort is quite clever, even if disgustingly so. The one thing I didn't understand completely was Dumbledore's explanation of how Nagini is a horcrux. I can understand that she is, but Dumbledore said that Voldemort used her to kill an old man - which we saw at the beginning of Goblet of Fire - and that5 was the death, that splitting of his soul, that he used to make her a horcrux. But I don't understand how, by Nagini killing that man would split Voldemort's soul. Yes she did it on his orders, but he didn't actually kill him himself, so that confused me a little. And then there is the death of Dumbledore. Oh, it's so sad! Even now, years after first reading this book, I still get all upset. I remember how I felt about Snape the first time I read it. Although I despised him with a passion along with Harry, I did kind of go along with the idea that, well, Dumbledore trusts him, so he's just a bitte man taking it out on the only one he can, Harry. But then you read about the Unforgivable Vow, and you start to wonder... and when you realise that Malfoy has to kill Dumbledore, and that's what Snape vowed to do in his stead if Malfoy couldn't, and I was completely shocked. And when he does... oh, the hatred! Even I felt betrayed, because I trusted him even if Harry didn't. Oooh, it was awful! And Dumbledore's funeral, and Fawkes' song! So, so sad! And Harry without the last person he counted on, he looked up, he believed would keep everyone, including him, safe. And then Harry has to split up with Ginny after only just getting with her! I was so happy they got together, nd then he has to leave her, it's so sad! Though I would have liked to have seen more of them together anyway, I think that would have been really sweet. Another brilliant book! I absolutely love this series! I recently reread the series and I have to say that this is my favorite of the series as well. It's so fluid and while much of it is backstory, the pace still feels quick. It's just so clever isn't it? I love it!